When all three darts are thrown at the same inning, the game is a group dart game. When each dart is thrown at a different target, the game is a split dart game. When playing a group dart game, players can use the first dart to try to hone in on the target. If the first dart is thrown low, they know to throw the next one higher. If the first dart hits its mark, they know to to change nothing. 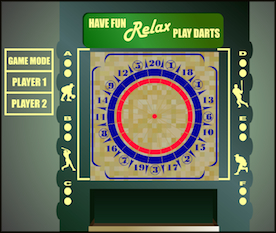 In a split dart game, players are not given that option. There is no honing in, either you hit the target, or you don't. Since darts are usually thrown in groups of three, split dart games almost always consist of three locations per shooting round. Most games have three shooting rounds in them, but you can have five, or as many as you'd like. Any of the group dart games can be converted into split dart games easily. Simply throw one dart instead of three at each location. Six - Eleven - Cork is one of the popular split dart games. The cork is usually worth 5 points in this game. Since these innings are at the same height, just opposite sides of the board, this game works well with the idea of split darts. Ten - Fourteen - Ten brings the tenth inning into play. 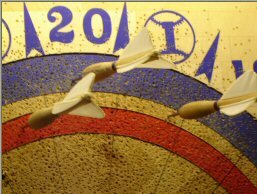 It is commonly played that both darts thrown at the ten must score for any of the points in the inning to count. Also, the dart to be thrown at the fourteen must land to the left of the cork. This is to prevent players from throwing all three darts at the Ten in order to hone in on the inning, and have a better chance of scoring with both the first and third darts. Four - Six - Two is another split dart game. These innings appear on the right hand side of the dart board. All three innings are used in the game of baseball, although they are not shot in this order. Five - Twenty - Ace is another popular split dart game. These innings appear across the top of the dart board, making them a good combination for a game. This game is often played as a "progressive stop" game (see Variations).